Alone in the high-mountain desert, self-sufficient Betsy Lynch is determined to eke out a living selling goat cheese while she fulfills her father’s dream to find a rich silver lode. Claim jumpers threaten to take everything she holds dear, so Betsy uses a bullwhip, her wiles, traps, goats, and an attack rooster to defend her land. Rancher Dex Madsen needs to feed his hungry crew. He tracks a herd of pronghorn and shoots one, then steps into Betsy's snare and is jerked upside down. The goats and rooster attack before Betsy cuts him down, and soon he's neck deep in her fight to protect the claim. But can he get past that killer chicken to claim her heart? 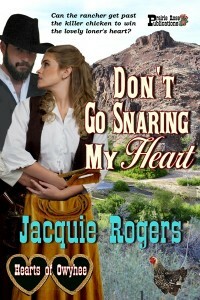 Return to southwest Idaho in the 1880s in Jacquie Roger's acclaimed Hearts of Owyhee series.